4. Protects you from sunburn - Sunburn is not only bad for your skin but it's also extremely painful. 5. Sunscreen keeps your skin beautiful - Essential skin proteins such as collagen, elastin and keratin keep the skin smooth and healthy, the sun damages them therefore use sunscreen to keep your skin gorgeous! 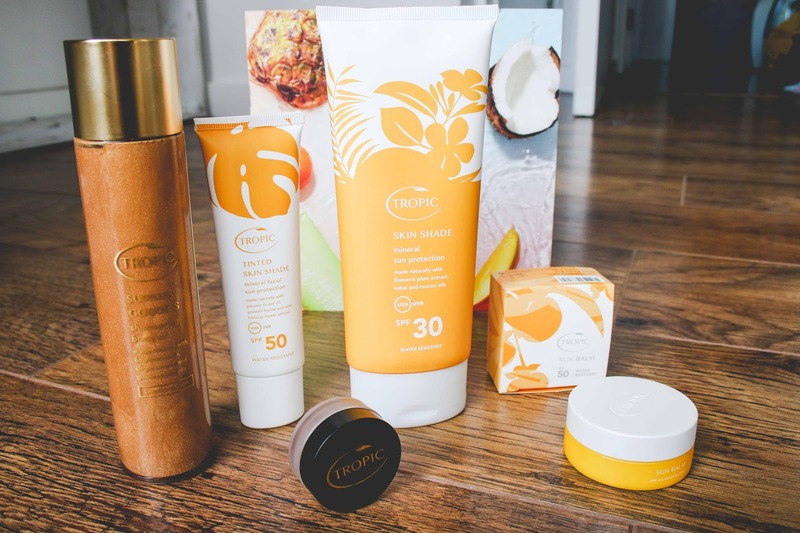 Okay, so now that I've convinced you why you need to be using sunscreen I can tell you about my favourite sunscreen range this season from Tropic skincare. 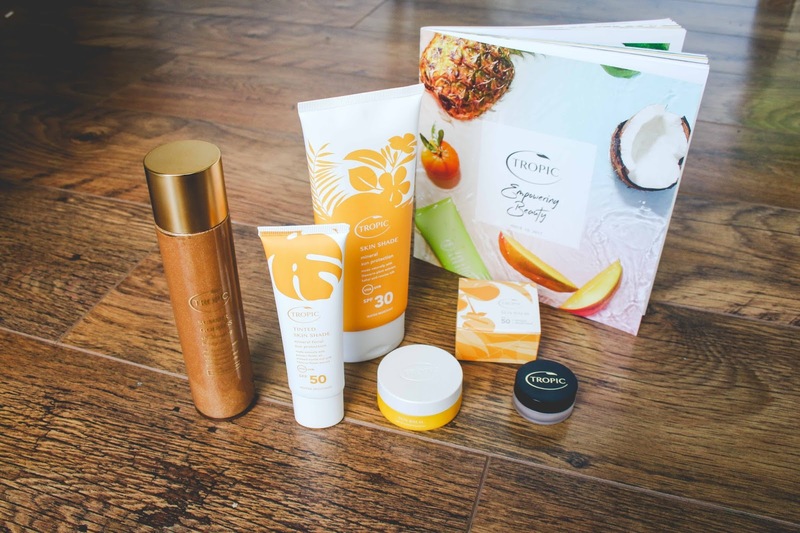 I have briefly introduced you to Tropic Skincare in my current skin care favourites post, they're a cruelty free (yay) all natural vegan skin care and make up brand. They have released a range of all natural sun care range suitable for sensitive skin which I talk about in more detail below. Skin Shade Mineral Sun Protection SPF 30 - I've been using this everyday all over my body and I love it. It leaves my skin protected and hydrated without feeling sticky and greasy. It's rich in omega fatty acids and some exotic natural oils. My skin is naturally dry and the sun dries it out even more so having a sunscreen which is moisturising means that I have to apply body lotion less and keeps my skin and tan from peeling. I would say the only down side to this sunscreen is that it doesn't really have much of a scent. Sun Balm SPF 50 - This sunscreen has been my saviour recently! It’s so small and fits in any handbag, taking up barely any space. I take it everywhere I go incase I start to my nose, shoulders or ears burning. Tinted Skin Shade SPF 50 - This is a sunscreen which acts like a BB cream, as it provides a light coverage leaving the skin looking much smoother and more radiant. If I have to pick my favourite product from the range this has to be it! I have always really struggled with find sunscreen that didn't break me out in spots and I've finally found it! It gets absorbed into the skin (although it takes a little longer to absorb than a regular bb cream) and doesn't leave my skin feeling greasy. If I'm having a bad skin day and want more coverage I just blend a little foundation with it before applying. Shimmering Body Oil - This is definitely one of the prettiest skin care items I have ever owned, the shimmer is gorgeous. This product is a blend of virgin coconut and golden jojoba oils with a natural vanilla bourbon scent. I love using after sunbathing or before I head out for the day or evening. It leave my skin feeling moisturised, smelling lush and I've received compliments on the shimmer on my skin before. I love it and don't want it to ever run out! Cream Highlighter - I have to be honest until now I haven't been very into cream highlighters, the couple that I've tried that just didn't seem to do as much as powder highlighters. I was intrigued when I saw this in the summer collection though and decided to give it a try. Much to my own surprise I actually really like it. It glides on the skin really easily and you need to use very little of it to achieve a strong highlighting shimmer. When it's sunny and warm I like to keep my make up very minimal and light, so often I will wear the tinted sun shade, this highlighter and a little mascara. Have you found any sunscreen products that you love this season? I'd love to know what they are! Great post Dei, everyone needs to be sun safe and realise how important SPF is. I tend to wear a much higher factor on my face and actually prefer the face specific SPF's a lot of brands do too. The tinted products sound great! In summer sun rays damage our skin. It makes our skin dark, dull and it snatches are glowing. Sun rays very badly affects our skin. So to prevent from such kind of damage uses good moisturizers for your skin. It's not greasy, pore clogging or heavy on the face, just smoothing and sort of hydrating at the same time. Basically, it's a primer, and SPF in one - who wouldn't want that! It's velvety smooth goodness. It really annoys me when people don't wear sunscreen products, especially when they're excuse is 'oh but I was a good tan'. 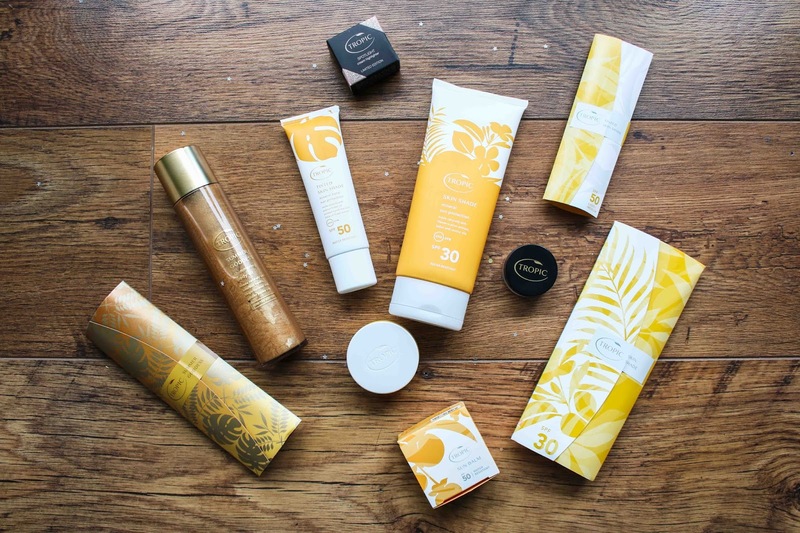 I didn't realise they did a sunscreen range as well - I've tried their other products and loved them so I'll be taking a look at buying some of these as well!